In Excel 2013, one powerful method for retrieving data from an external data source, such as a database, is to retrieve the information directly from one of a database’s tables. In relational databases, as in Excel, information gets stored in tables. 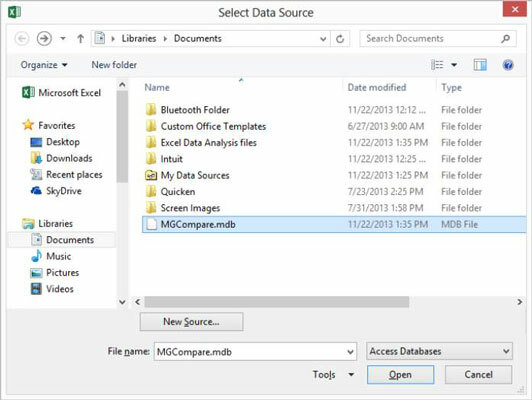 1Choose the Data tab’s Get External Data from Access command. 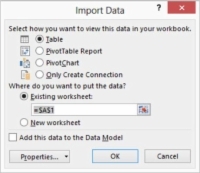 Excel displays the Select Data Source dialog box. 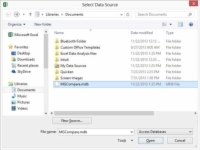 2Identify the folder that stores the database from which you will grab information. Select the drive and folder where the database is stored using the list boxes provided by the Select Data Source dialog box. 3After you see the database listed in the Select Data Source dialog box, click it and then click Open. If Excel displays the Select Table dialog box, continue to Step 4. If Excel doesn’t display the Select Table dialog box but instead displays the Import Data dialog box, skip ahead to Step 5. 4If Excel displays the Select Data Source dialog box, select the table that you want to retrieve information from by clicking it; then click OK.
Excel displays the Import Data dialog box. 5Select either the Existing Worksheet radio button or the New Worksheet radio button to tell Excel where to place the information retrieved from the table. If you want to place the data in an existing worksheet, use the Existing Worksheet text box to specify the top-left cell that should be filled with data. In other words, specify the first cell into which data should be placed. 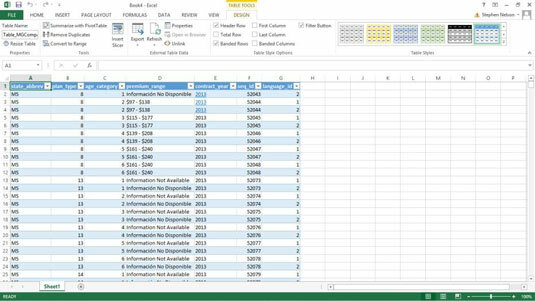 Excel retrieves information from the table and places it at the specified worksheet location.